Every outfit looks so nice! I can't choose my favourite, cause I love all of them! This is my number one but absolutely ALL the looks are amazing! I love your style! Love all those looks! Great blog and Great taste!! Lovely looks!Great blog. What about following each other? You look awesome in all of them!!! My favorite is the black & white dress with the neon yellow clutch!! But all your looks are amazing, you have such great style!! Hello lovely! I couldn't even tell you which is my favorite because you look amazing in every picture! You have fabulous style! I just found your blog and I'm so hooked on it, I'm your newest follower! I love that you do a roundup of your looks!! It's so cool to see them side by side! Very stylish! awesommeee, that's a great idea to recap all of your looks! You look amazing in every outfit, it's hard to choose just one. But if I haddd to choose, its a toss up between the blue peplum top with yellow clutch or the all white outfit on the bottom left. 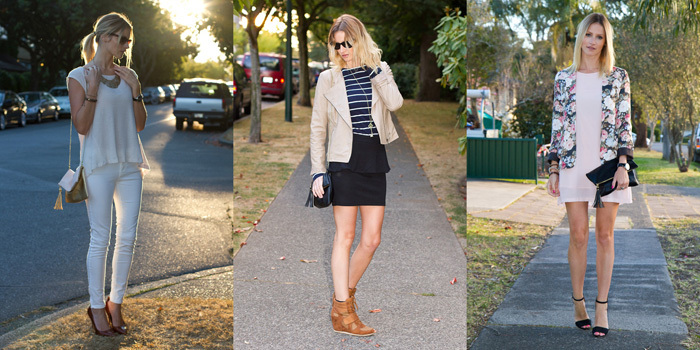 you use each piece in your wardrobe so thoughtfully - love your shoe and jacket collection! Glad you like my blog, Thanks for following me back :) Have a great day! the LAST one with the amazing floral blazer! You are a very beautifull girl, no dout about it! Amazing looks. Perfect style.. Nice. Thanks you dear, following you on GFC and Bloglovin. The first one on the bottom row is my favorite. It's so simple but cute! The green blouse with leather skirt is definitely my favourite! Such a cute/tough look; I love it. I'm so glad leather is coming back in full force. Look at the past month, you have a very polished style. Everything is so perfectly put together, and you do a great job of colour blocking. I'm glad you had some feedback on my writing style, because to be honest I haven't had anyone really tell me about it and I've always wondered if people read or just look at the pictures lol! but all your outfits are great.